The American-trained Yoshida was the three-quarter length winner of the G1 Old Forester Turf Classic Stakes at Churchill Downs on May 5 and the Japanese bred four-year-old heads for the G1 Queen Anne Stakes over the straight mile on Royal Ascot opening day, Tuesday, June 19. Riley Mott, son and assistant trainer to father Bill, reported: “Yoshida's in great form. He traveled over nicely and has settled in really well at Newmarket at Abington (Place Stables). His appetite has been good and we're very happy. “Yoshida has taken a step forward from his win at Churchill Downs and I think that victory gave us the confidence to come over here and give it a shot. “The straight mile is an unknown here, but I can't see it hurting our chances. We're bringing over a strong horse with a high level of fitness so hopefully the straight mile can play to our strengths. “We've always thought he was top quality horse. He identified himself early on as a top talent, so it's been nice to see him progress over time and we're looking forward to seeing him progress again at Royal Ascot. “His two best races have been on soft ground. His last race at Churchill Downs was on heavy ground, but he has also won on firm ground, so I think he is a horse who is pretty versatile. It takes a great horse to adapt to certain situations and this horse is one. “We also think he is pretty versatile as regards to both the trip and where he can be positioned in his races. “You don't want to be too bullish in these contests and you have to respect the opposition, but we're delighted with Yoshida. “He traveled over really well and he is giving us a lot of hope with his well-being and confidence, so we're keen to take a stab at the contest. Another American Tim Glyshaw saddles Bucchero in Tuesday's G1 King's Stand Stakes over five furlongs with the six-year-old son of Kantharos running without Lasix and on a straight course for the first time in his career. Glyshaw revealed: “Bucchero has taken the trip over really well and has trained nicely since arriving. He has eaten up and we couldn't ask for more. “He always gives his all in every race. He ran well at Keeneland in April when second to Bound For Nowhere and, at Churchill Downs last time, he got hit pretty hard on the turn which ruined his chances of winning (finished third), but if he goes out and runs his race on Tuesday then he is going to be very competitive. “There are some questions marks as he has never run without Lasix or run on a straight course, but I think none of those will be excuses for him. “This is his fourth run back from a layoff and in America we usually think the third or fourth race is where you are at your best. “Lady Aurelia and Battaash are top-class horses and they might have to run below par if we are to get the better of those two. “We've only run against Lady Aurelia in the Breeders' Cup Turf Sprint when she was below par after a long season, but her form at Ascot has been excellent, so it will probably take a below par run from her if we are going to get the better of her. “Battaash looks very strong as well and it's going to be challenging, but we wouldn't have come over here unless we thought we had a chance in this event – we think he has a decent chance. “I have 20 horses at Churchill Downs and 10 horses at Indiana Grand. As of a year ago, I would not have dreamed of any of this. “Bucchero won the G2 Woodford Stakes last year which was very special before going to the Breeders' Cup and finishing fourth. It's Bucchero's job to carry the flag for the barn. I had never been any place outside of America a year ago and now I'm going to Royal Ascot, so it is a big deal. We are a small stable at home so this kind of stuff doesn't happen to us much. 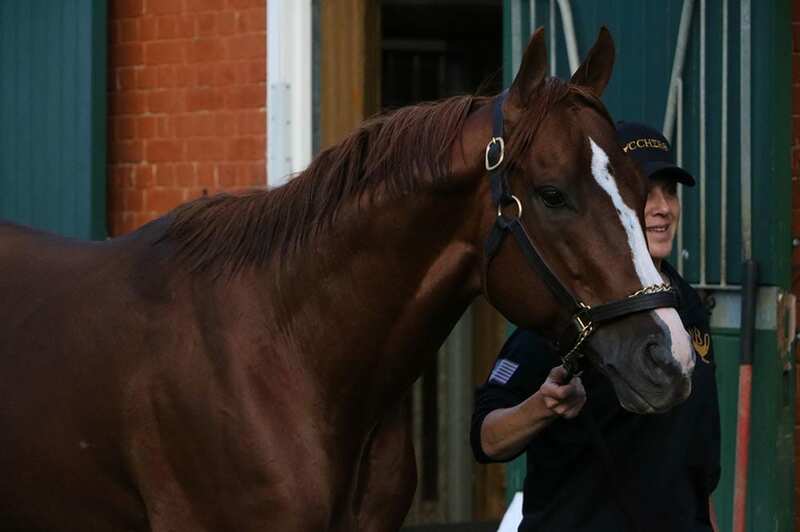 Bucchero is owned by Ironhorse Racing Stable which currently has four horses in training. Managing partner Harlan Malter bought Bucchero for $43,000 and is relishing the horse's participation in the King's Stand Stakes. He will be ridden by Jose Ortiz, who enjoyed a stellar 2017 by winning his first Triple Crown contest aboard Tapwrit in the Belmont Stakes and finishing the year as the leading jockey in the United States by earnings ($27,318,875). “We're very excited to be at Royal Ascot”, said Malter. “One of the reason we decided to come here was to give the horse a try at a straight five-furlong course. He is a big, downhill-type runner and whilst he doesn't have the typical European style of running, he builds up his momentum and speed. When he realises he doesn't have to turn, I think we could see a really big run. “He runs without Lasix and obviously that is a slight question mark. I think without Lasix, we have to just roll the dice, but I don't anticipate that being a problem. “Every horse when you move them up in class, you wonder whether they are going to struggle, but he has handled moving up to G1 company brilliantly. “We understand that this is tough competition on Tuesday, but he has run many fine races, including when fourth in the G1 Breeders' Cup Turf Sprint at Del Mar in November, where he was slightly unlucky to only finish fourth. “If he gets the right trip, I think he can be ultra-competitive. It's a big opportunity for Jose Ortiz who has proven so much in the States and he probably realizes this is a massive opportunity for him to prove himself over here – he's extremely excited to come. “For most American turf sprinters, they are sometimes questioned as to whether they are good on soft ground, but he ran well on it in the Shakertown at Keeneland in April behind Bound For Nowhere who Wesley Ward really rates. “I think that run at Keeneland gave us the confidence to come here and he also ran well at Churchill Downs last time where he had to go very wide round the turn. He was broadsided and he wasn't beaten far so we were happy with that effort. “I've been a horseracing fan forever and the horse that got me hooked in the game was Bill Mott's Cigar and at the moment I am getting to spend time with his son Riley discussing that horse. “Being at Royal Ascot is a dream come true for me as Ironhorse is a very small operation. Bucchero cost $43,000 and he is the most expensive horse we have bought. This entry was posted in NL Article, Racing and tagged abington, bill mott, bucchero, Harlan Malter, Kantharos, King's Stand Stakes, Newmarket, Queen Anne Stakes, riley mott, Royal Ascot, Tim Glyshaw, yoshida by Press Release. Bookmark the permalink.